We just love this classic toile by P. Kaufmann called "Snapshot", but we call it "Around the World" because it shows so many gorgeous scenes of cities in other countries. 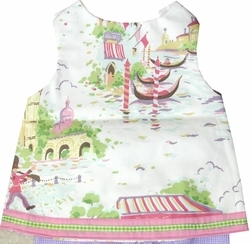 The fabric shows London, and Paris, Venice, among others. 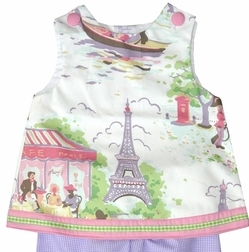 The dress/top is made with the toile and is embellished at the hem with a strip of pink/rose fabric and lime green gingham ribbon sewn in the middle. The trousers are made with lavender gingham and are trimmed in the same rose fabric and lime green ribbon. 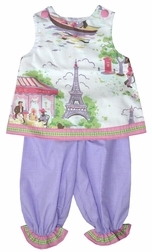 Personalize it with your little one's monogram in pink/rose OR lavender if you choose the trousers.